Millennials represent many things to many different people — but to the US Census Bureau, they represent the largest American generation in history. They’re poised to drive huge trends across the country, as they’ll finally come of age as financially potent, family-forming adults. No American financial sector will remain untouched by Millennials’ surge — including the housing market. ...yet our survey also revealed that nearly 50% of Millennials say they do not want new development in their city. Meaning, the same demographic planning to purchase houses in the next few years is also responsible for opposing their construction. Unfortunately, the negative implications of this stance are profound – and due to their lower average income and homeownership rates, Millennials are in jeopardy of losing more than anyone if they get their own way. Due to stringent building regulations, swelling populations, and an increasing shortage of construction labor, the United States’ most populous cities are in the squeeze of a widespread housing affordability crisis. How many times have you seen Millennials portrayed as a generation content to laze in their parents’ basements sustained by avocado toast? Plainly false. While it’s true that more young people live at home with their parents than in any other arrangement, older Millennials, now in their 30s, are finally shaping the housing market. Fundrise’s survey revealed that nearly two-thirds of Millennials want to buy a home in the next 5 years, and nearly one-quarter are looking to purchase within one year. With roughly 80 million Millennials living in the US today, that means over 50 million Millennials will be looking to buy homes by 2022. The survey results are in line with CoreLogic projections that housing demand will reach a peak in 2023. Yet just as demand for housing is about to reach a historic peak, for-sale listing inventory is down nationally to its lowest level since 1999. The problem is especially acute for starter homes, with starter home inventory declining at 17% year-over-year, nearly twice the rate for all homes. Worse yet, the problem is particularly severe in the walkable, amenitized urban neighborhoods where Millennials demonstrably prefer to live. A survey from the Urban Land Institute revealed that 56% of Millennials preferred to live in walkable, mixed use neighborhoods. Our survey results echo this data – our respondents prefer to live in cities more than in any other location. The reasons for this shift back toward city-dwelling are clear: America’s cities have seen a massive revitalization over the past several decades with rising inner city incomes, higher graduation rates, waning crime, and robust inflows of young professionals. These urban hubs have become more than just de rigueur – they are wellsprings of culture, community, and economic opportunity. However, existing housing inventory in major cities pales in comparison to anticipated demand. Using raw data from Trulia, the total available inventory of starter homes on the market in the top 25 MSAs totaled roughly 57,500 units in Q2 2017. This inventory can meet less than 6% of projected demand within the next year1. Even worse, Millennials are finding it difficult to save for down payments. Despite the economic vibrancy of large cities, Millennials are seeing their paychecks stretched much thinner as a result of the high costs-of-living and, in particular, high rents. In 2013, more than 20% of renters spent at least 50% of their income on rent in 11 major cities. In addition to these higher costs, over 50% of Millennials in states like California are earning less today than their parents did as young adults. In other words, lack of residential inventory is not only reducing homeownership options for Millennials, it is pauperizing them as renters, rendering homeownership further and further out of reach. There’s a simple solution to exorbitant rents and insufficient supplies of for-sale homes: build more residences in high-demand neighborhoods, exactly where young people want to live… right? Not so fast. According to US Census data, single-family home construction remains well below both its pre-crisis peak and its long-term average. In Los Angeles, only one new home was added for every six new residents from 2010 to 2015. Similarly, the number of new homes in San Francisco year-over-year is plummeting: In 2015, the city added no more than one housing unit for every 22 new residents. Thanks to a variety of barriers, running the gamut from high land prices to restrictive zoning codes to lengthy, uncertain, and expensive entitlement processes, new residential development in high-demand urban metros is virtually impossible for all but the most experienced and well-connected operators. This kind of development is especially difficult and expensive in major cities because of the powerful political advocacy of incumbent property owners. With the slogan “Not In My BackYard,” these “NIMBYs” have both the means and time to vocally and effectively fight new development in their neighborhoods. Their objections are not surprising though. Established, affluent homeowners have a vested interest in artificially limiting the production of new housing inventory in their neighborhoods due to the simple fact that the prevention of additional homebuilding inflates the value of existing homes – a major financial benefit for the people who inhabit them. Consider that the top 10 most expensive zip codes in the country are all located in supply-constrained markets where it is notoriously difficult and expensive to build. Have Your Avocado Toast and Eat it Too? While there’s little doubt that relatively rich residents in flourishing neighborhoods stand to reap enormous gains by limiting the construction of new homes in their communities, a preponderance of data also suggests that virtually everyone else stands to benefit from new development. Lower-income households would benefit from increased access to safe streets, better schools, amenities currently unavailable, and more job opportunities. Workers would benefit from shortened commute times. Employers would benefit from increased productivity. The environment would benefit from reduced sprawl-induced carbon emissions. And Millennials would benefit from an increased supply of housing providing lower rents and cheaper homes. 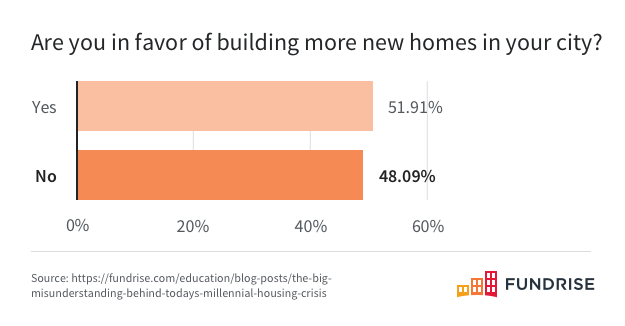 While it makes sense for wealthy owners to drive up the value of their homes by opposing new construction, it’s far more surprising that Millennials — the group most in need of new housing — would oppose new development, too. 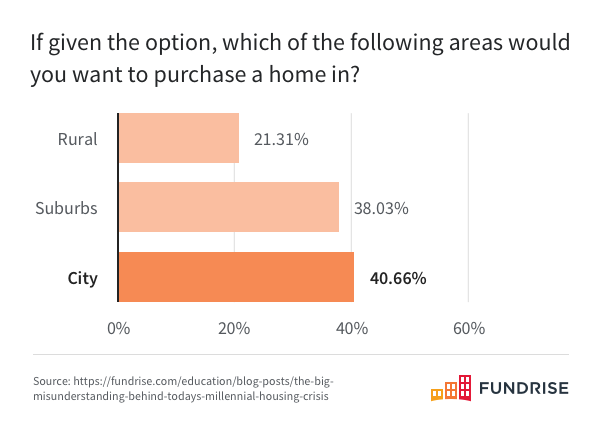 Though an undersupply of housing is clearly at the root of the affordability crisis that many young adults wrestle with today, our survey found that nearly 50% of Millennials are opposed to building new homes. Millennials are continuing to oppose new development in droves, against many of their own interests, and, as a result, are exacerbating the housing crisis. Whatever their reasons, by denying their cities new developments, millennials deny themselves and their poorer neighbors affordable rents, their city its continued growth, and many people — again, themselves included — the opportunity to buy a home in the future. Millennials are, ultimately, the demographic most harmed by NIMBY policies. In order to combat the upcoming housing crisis, it’s vital for Millennials to be educated on the real effects of regulatory barriers to development, so that they can help usher a sweeping shift in policy — before their chance at a diminishing rent burden and homeownership slips away. Getting behind local YIMBY (Yes-In-My-BackYard) organizations or attending city council meetings to advocate for change are two simple ways to kickstart the shift. Additionally, as part of a novel and innovative solution, Fundrise aims to give Millennials a vested stake in supporting new housing development in urban areas, even before they are ready to purchase themselves. By empowering young adults to invest both time and capital in the cities where they eventually want to live, we believe we can align Millennials’ financial interests with the successful provision of housing in high-demand areas. This, we hope, will help chip away at the larger specter we are facing as a society – the most significant housing inventory shortfall in history. 1. According to the US Census, there are 83.1M millennials in the United States. Per US Census data, 41.15% of people living in the US reside within the top 25 MSAs. Fundrise’s survey results revealed that 22.48% of Millennials would like to buy a home within the next year. 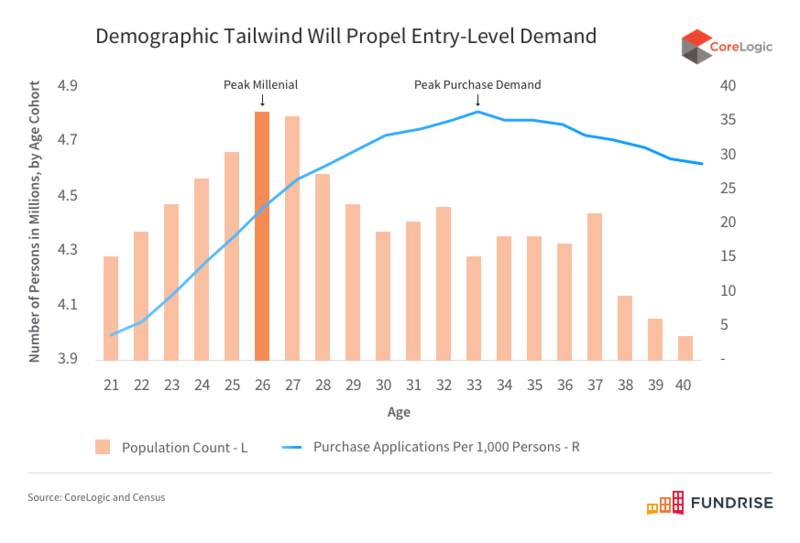 Assuming two Millennials per housing unit, this implies net new demand for roughly 3.84 million homes within the top 25 MSAs over the next year. To estimate inventory, we take into account that, per Trulia data, as of 17Q2 the total inventory of starter homes on the market within the top 25 MSAs was roughly 57,335 units in 17Q2. Given that the median home takes 65 days to sell and that starter home inventory within the top 100 MSAs in the US fell by 15.6% year-over-year as of 17Q2, we overestimate annual inventory within the top 25 MSAs at 4*57,223, or 229,340 units. This implies a shortfall of 3,610,660 homes, or 94.03%. The publicly filed offering circulars of the issuers sponsored by Rise Companies Corp., not all of which may be currently qualified by the Securities and Exchange Commission, may be found at www.fundrise.com/oc. The eFund investment model is changing the way housing development works with the goal of meeting the need for more affordable housing where demand is outpacing supply. The appearance of the first eFund home scared off other investors, but with a modern renovation from a knowledgeable team, we believe that the La Vista home offers potential that is rare in Los Angeles.